This dress is groovy. It made me feel happy like an old time movie. In case you are too young to recall those are lyrics from this catchy song, Do You Believe In Magic? by the Lovin’ Spoonful released the year before I was born. 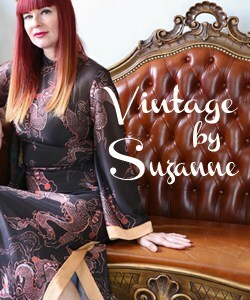 This is the one piece of vintage clothing I bought when we did the Toronto Vintage Clothing Show just over a month ago. I spotted it hanging in someone else’s booth and thought there was no way it would fit me. I guess the stress of the show made me shrink a bit as I managed to squeeze myself in. When you shop on the fly like I did you don’t always notice little things, like the fact that the dress is a bit short for me. This is a handmade piece so the gal that owned it previously must have been even more vertically challenged than I am. This length shortens me visually but it screams “I refuse to be ignored!” which is kind of what I go for some days. 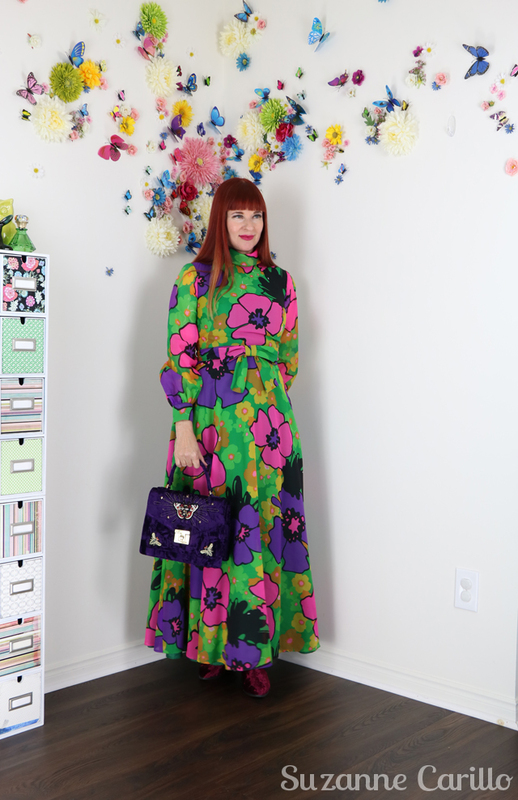 This extra large bold floral print does what all large prints do, they make you look larger. On a smaller frame oversized prints are hard to carry off. I’m doing my best here. What I lack in height I make up for in enthusiasm. The dress is so wildly happy. As a vintage reseller I certainly would be hard to miss which is kind of the point. I get to wear items that most people wouldn’t and possibly couldn’t ever consider due to their work situations. I don’t know how often you’d see someone running around an office looking like this. 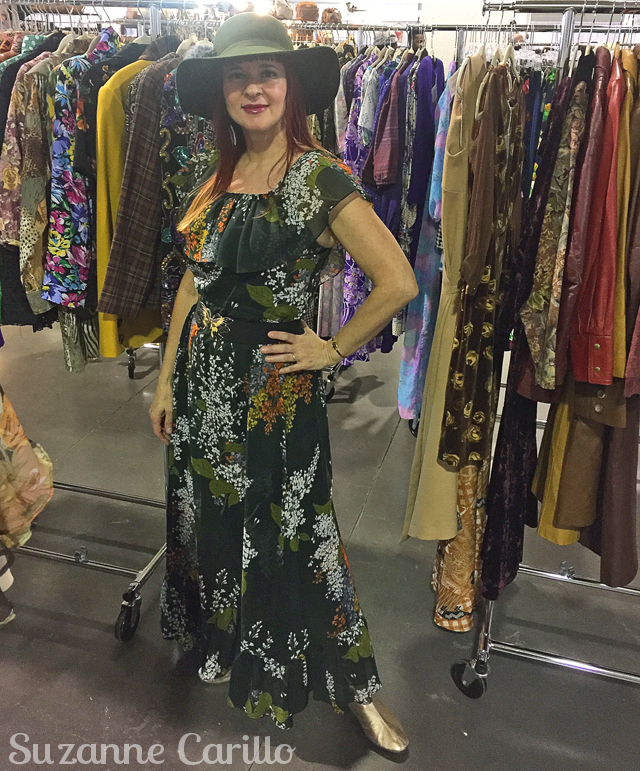 That is the bonus about being a vintage reseller, not only do I get to share my passion for vintage with the world, I get to dress as outlandishly I want. I discovered a long time ago when I had my other business designing and selling wholesale scrapbooking supplies that it was important to create a memorable image for people to associate with you. It is part of creating a brand. I was the artist and the brand. 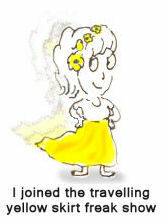 My company at the time was called Bisous (bee-zoo) which means little kisses in French. 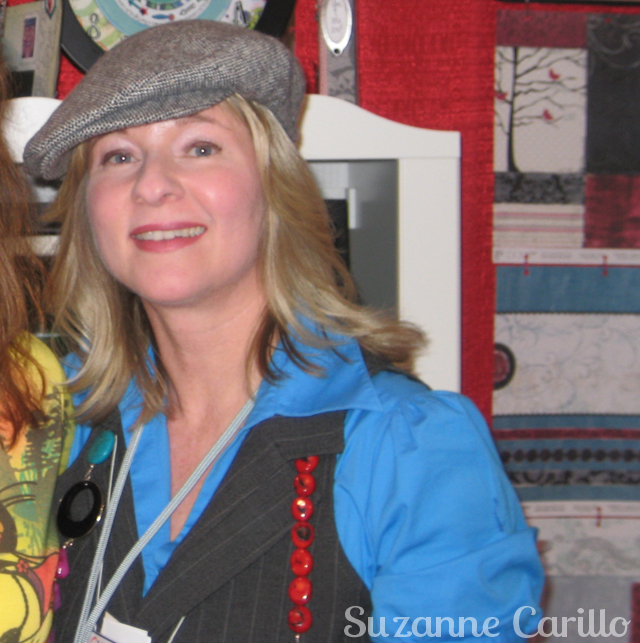 The photo below was taken at the Craft And Hobby Association trade show in 2009. I wore comfy motorcycle boots that helped me get through the ten hour days on my feet selling or teaching classes. I always wore a hat because few people do. It is an image defining accessory. In the photo above I added a massive stone necklace. 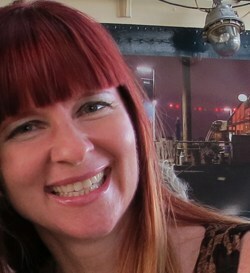 Yes, that is my real hair colour, blond. I went red a few years afterwards. As you can tell this was also before I paid attention to makeup. I still don’t wear makeup daily but I do like it when I go out or take photos. Otherwise it is difficult to decipher if I have eyes or not in photos. I didn’t even learn how to properly apply eye make up until a few years ago. 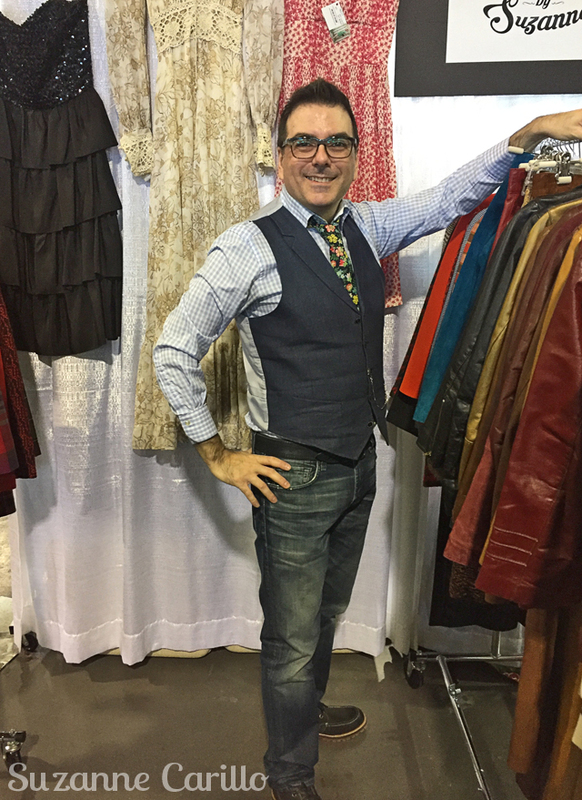 I used to take photos of all of the outfits I would wear during the trade show. It was part of my show preparation. While at the show I need to be focused on sales knowing that the other details were already looked after. I also did this for trips. I will share some of these outfit photos in another post. I think it is very telling to see how my personal style statement has evolved over the years becoming brighter and bolder as I age. Wearing clunky boots to help me through 8 hours of standing on cement. My feet still killed though at the end of the day. All items vintage/thrifted except the boots (which I’ve had for some 15 years) and the scarf which was a purchase from ModCloth years ago. Thankfully it wasn’t as full at the end of the show. 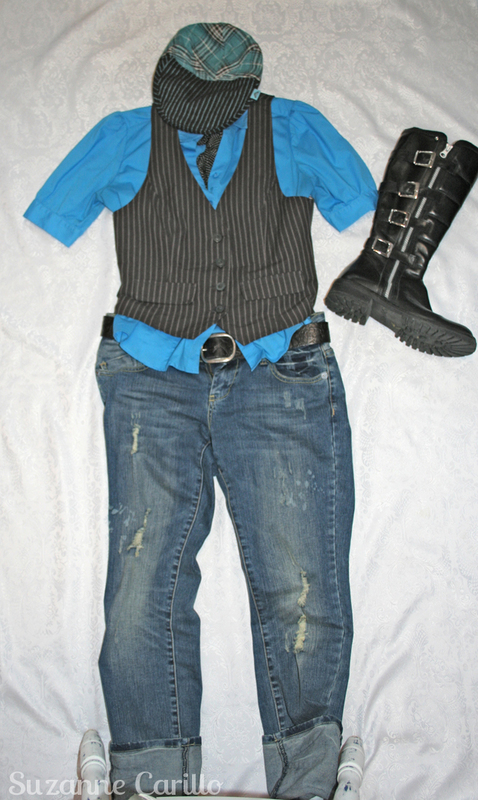 My style evolution is becoming louder, more eclectic (some would say eccentric) and more visible as I age. How has your personal style evolved over the past ten years? 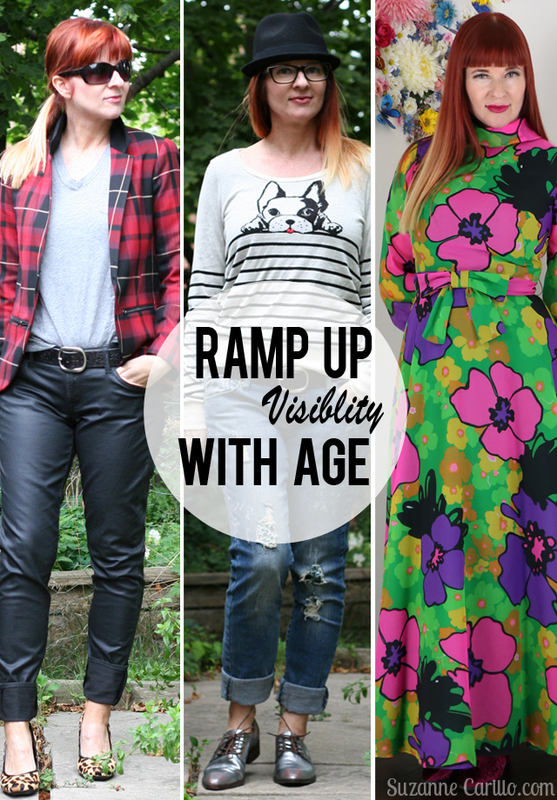 Are you becoming more or less visible? Why? I had to take a break from my gingham dress challenge today as I had “gingham fatigue” but I still have another post or two coming soon. 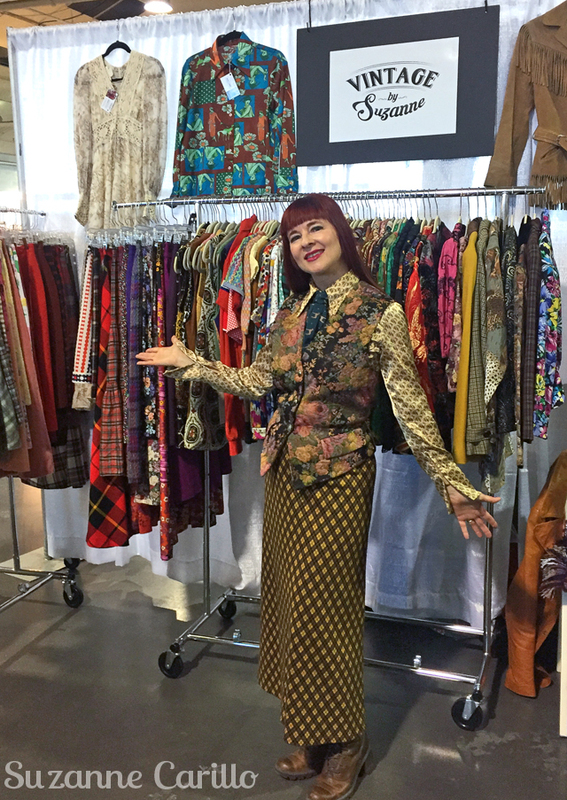 My first vintage clothing show as a vendor is over! That was lots of work! Shout-out to my husband for helping out, being the support that I needed and dressing for the occasion : ) Thank you! I have done similar type shows before selling jewellery and selling my scrapbooking lines, so I’m not a total newbie to the game of annual retail shows. The amount of time it takes to accumulate good vintage pieces, launder them all, deal with any staining, sew any problem areas, price all of the items and pack it all up for a show is enormous. Still, I didn’t find it as stressful as creating entire product lines from scratch and then having them manufactured in mass quantities to sell wholesale. In my previous life as a designer/manufacturer twice a year my back would go out due to over working and stress. 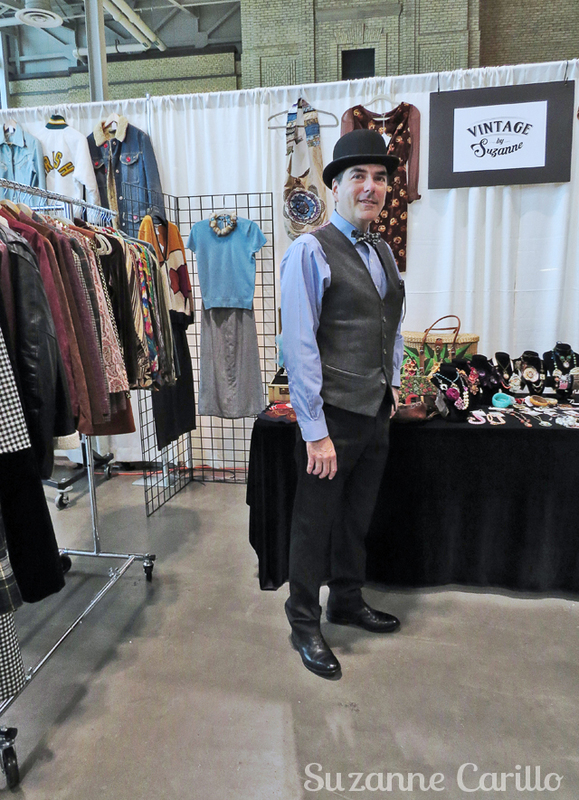 The vintage show was tough, but no one threw out their back. There wasn’t much wiggle room. Talk about making it all fit! Here is the booth on the first day. We changed things around a little bit on day two but I didn’t take any photos. 1. 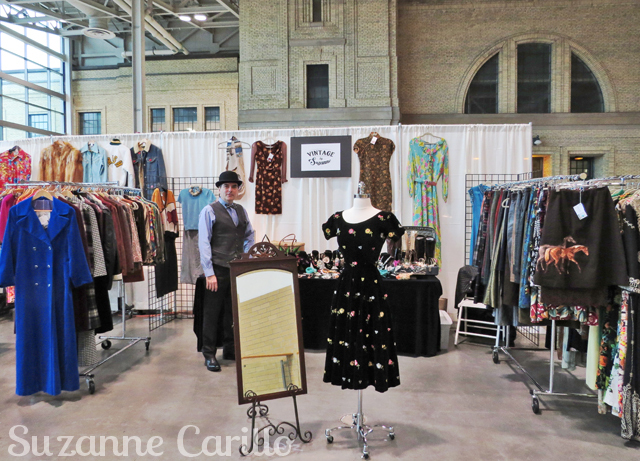 I adore vintage vendors. They are as quirky, eclectic and unique as the pieces they sell, many with wonderfully large personalities to go along with their stylish wares. 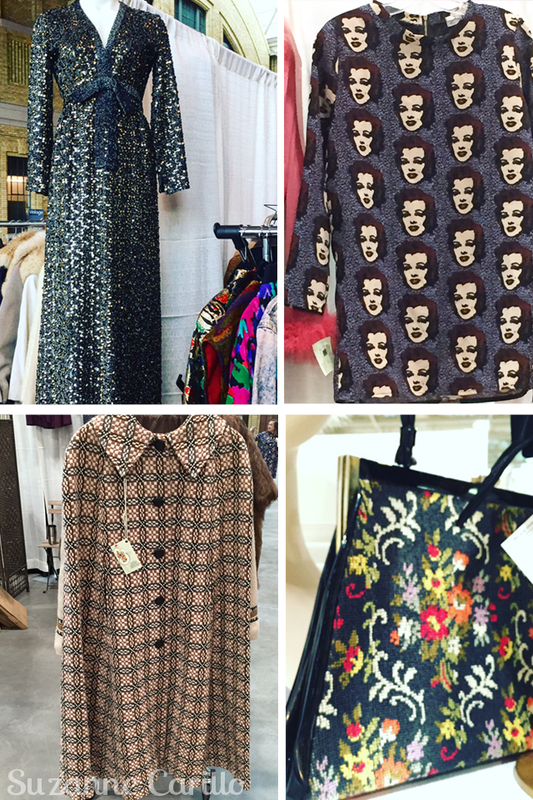 Some of the amazing items I spotted in other booths at the show. 2. There have been huge technological advances that make selling as an independent retailer much easier. Previously for my scrapbooking lines I had an old fashioned credit card machine…really old fashioned…the one that you run the card through with a piece of carbon copy paper. I had to have separate business bank accounts for the credit cards each costing loads in monthly banking fees and other fees associated with deposits and transactions. Often times I would get home and have someone’s credit card not go through when I went to process them online. I’d have to call the person and hope they would give me another form of payment. Now, with Square, you just go online, create an account, they ship you the appliance for your iPhone for FREE, and then they deposit the money into your bank account the next day! Also, you can see the payment has gone through immediately! Genius! Oh the time and money I could have saved over all those years. 3. I still do not care for rude customers. There is a polite respectable way of asking for a price reduction and then there is the rude way. Asking, ” Is this the best price you can do?” is polite. Telling me in a snarky voice that it is ridiculously overpriced and you most certainly will not pay the listed price will just get you kicked out of my booth. I don’t have an issue with taking the item and stating, “That’s okay, it’s already sold.” Me no care. 4. I love the fact that I do not need to “sell” anyone anything. 5. Being a buyer at a show or being a vendor is night and day. I knew this in advance but I didn’t completely understand until I lived it. I would have enjoyed the show much more had I been the one perusing the different booths, discovering amazing items and chatting with the vendors. As a vendor, there was pressure. I didn’t leave my booth much, I felt the need to be in the booth as I was responsible for my success or failure. 6. Everyone’s tastes are unique. Knowing what people will want to buy isn’t easy. Items I thought would be very difficult to sell were the first to go. Pieces I adore didn’t get a second glance. It isn’t enough to have pieces that appeal to people, they also need to be the appropriate size. 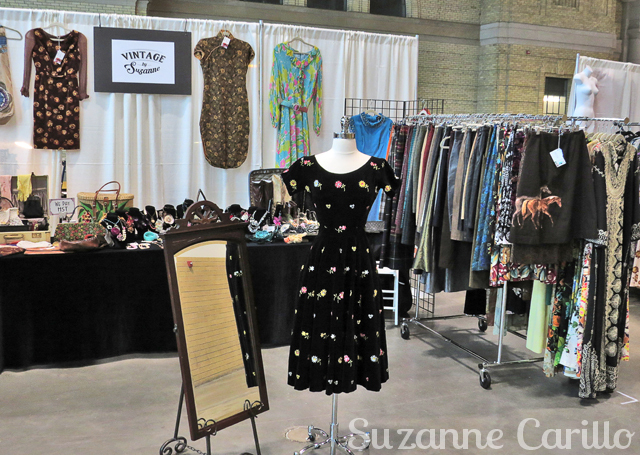 It is a bit of a lottery and one of the most challenging aspects of selling vintage clothing. Normally vintage is defined as items being at least 20 years old and less than 100 years old. Over 100 years old are defined as antique. 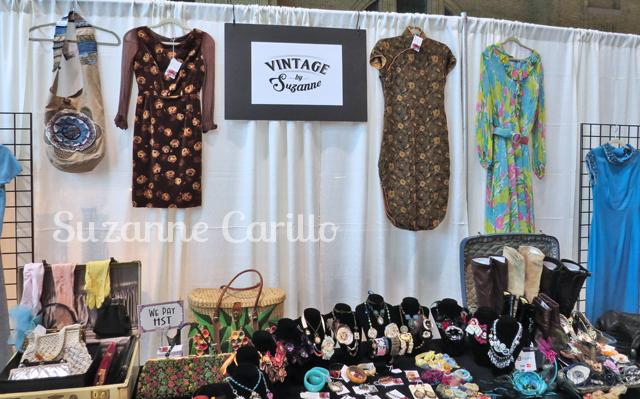 I noticed people at the show weren’t hung up on buying “vintage” as opposed to buying “retro” or simply something that was secondhand. This was surprising to me as I thought they would be die hard authentic vintage lovers. 8. I loved having the opportunity to dress up and have people appreciate it. I wish I’d taken more photos at the show as there were some people dressed to the nines. I also didn’t get any photos of myself. Bad blogger! A successful day is different for each person. Moving some inventory for some is fine, but for most vendors they need to make some money. What is considered monetary success varies with each vendor. I knew this from my previous shows but I thought it was especially true at this show. 10. I’m a decent negotiator. I don’t mind negotiating with people. I don’t take it personally (unless they are rude) and I don’t get pushed around. I view it as a personal challenge. Overall I really enjoyed the show. I met some great people and managed to come away richer than I went in. Having a willing expert partner at the show was also a big bonus. It made the whole process so much more enjoyable. In case you were wondering, no I didn’t buy a thing. 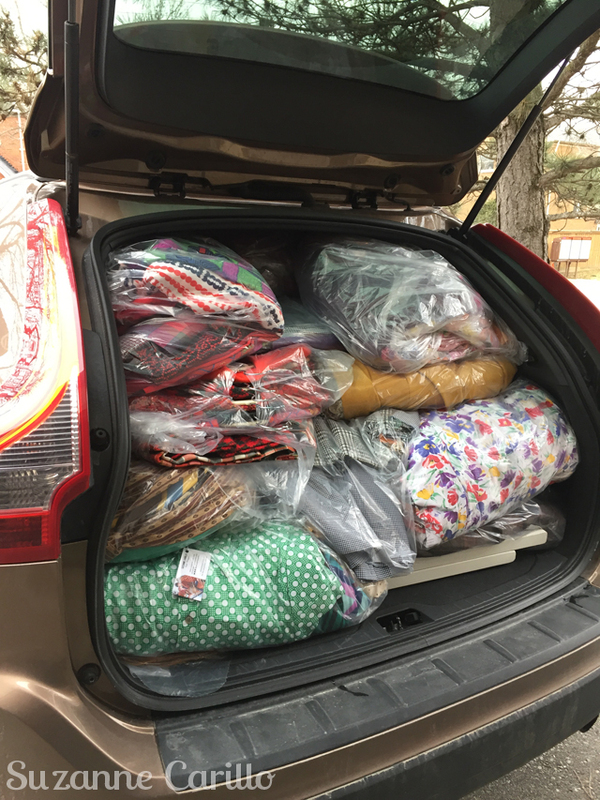 It was very tempting, but when I already had three racks of clothing, 90% of which I can fit into I felt it was a bit crazy to be adding to my collection. I did feel bad as I like to support vendors at independent shows like this and I am sure they missed my patronage. My remaining stock will slowly begin to appear in my Etsy store in about two weeks. I hope to take photos of me wearing most of the items and creating outfits again for my Instagram. I have lots of photos to take! 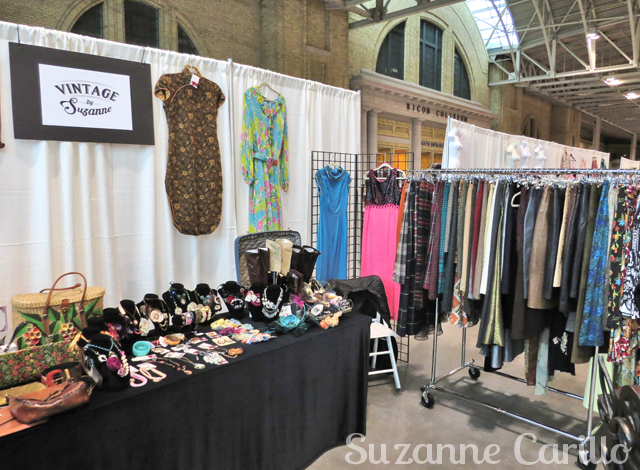 Have you ever been to a vintage clothing show? Did you enjoy it?